Has everyone had a chance to catch up since Sunday? 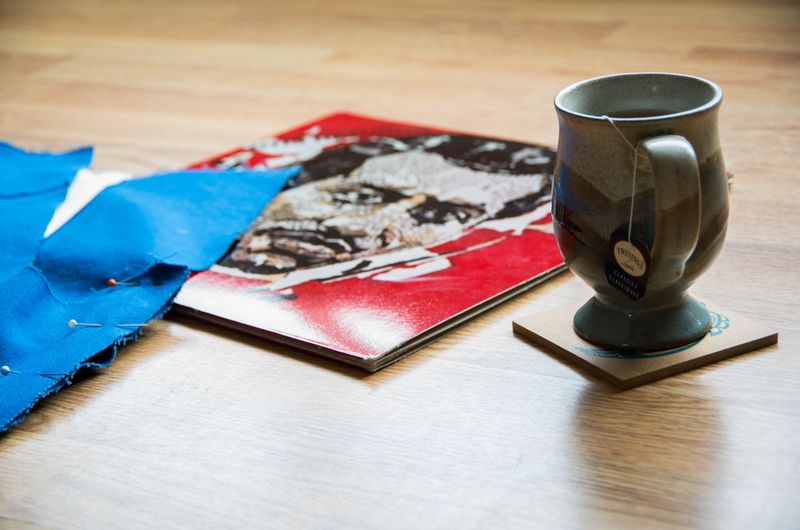 I hope so, because today, with our cup of milky Lady Earl Grey and a little Otis Redding, we’ll be sewing our flat fell inseams. 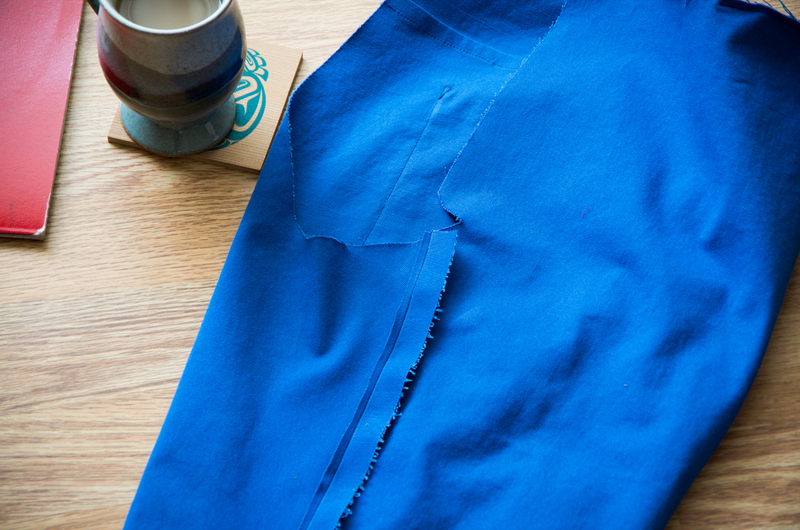 It’ll be a nice, easy, and short day since we’ve already perfected our flat fell seams on the back yoke! First, I’ve started by pinning the inseams together with the WRONG sides together. 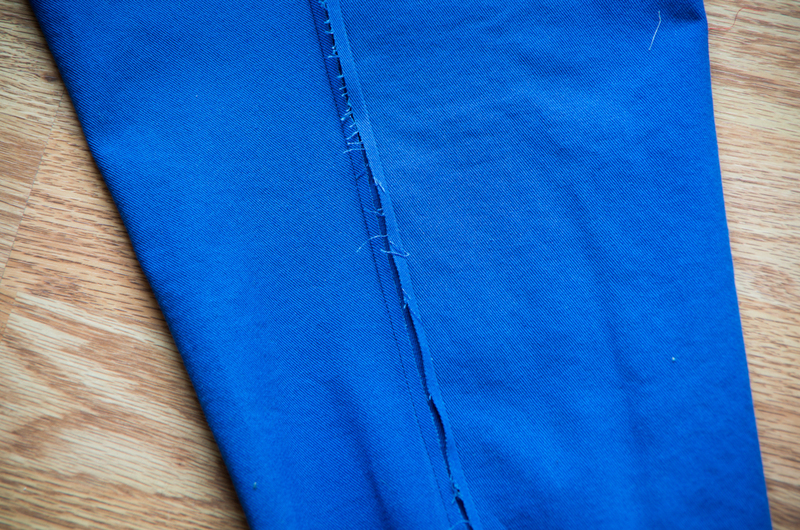 I sewed this seam at 5/8″ (you may need to ease a little bit as you sew so that the hem ends up even) and then carefully trimmed the seam on the Pants Back to 1/4″. Don’t catch the other half of the seam (the one belonging to the Pants Front) when you are trimming! 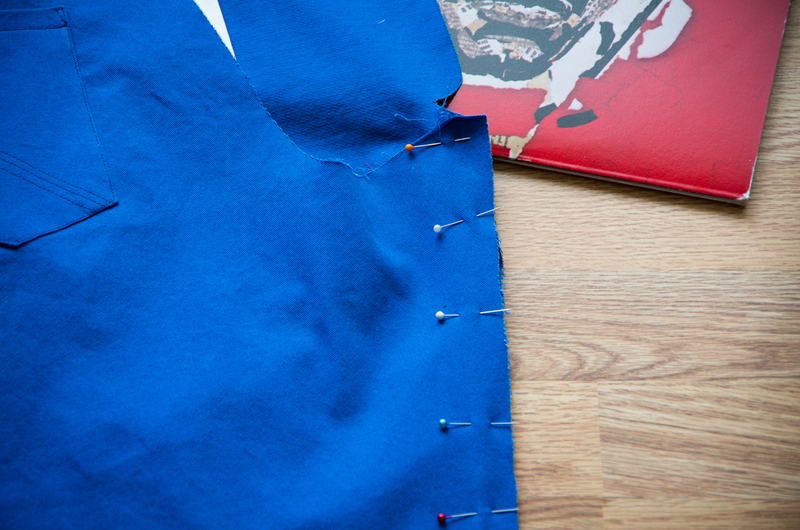 I’ve pressed the seam open (this will ensure your flat fell seam is crisp and even when it is done). 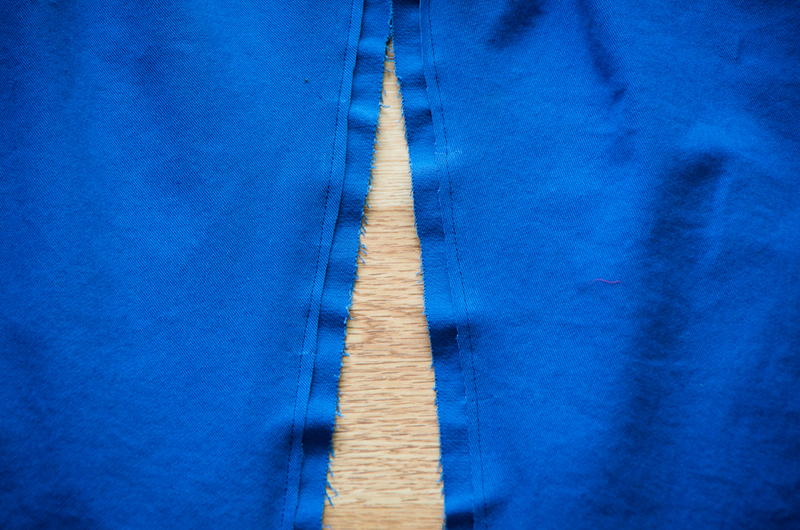 Next, I’ve pressed the seam entirely to one side (with the narrow seam allowance laying on top). And here comes the fiddly bit: I’ve folded the wide seam allowance in towards the narrow seam allowance so that the two raw edges meet in the middle. To do this I press as I go…keeping my fingers folding the seam allowances with one hand and following along with the iron with the other hand. Now I’ve sewn 1/8″ away from the loose edge, permanently enclosing the raw edges and creating a lovely (and strong!) flat fell seam. Sewing along the pant legs is a bit tricky because they form a narrow tube (though it’s easier with shorts than pants!) but believe me, it’s possible…and you can do it if you take it slow and steady! 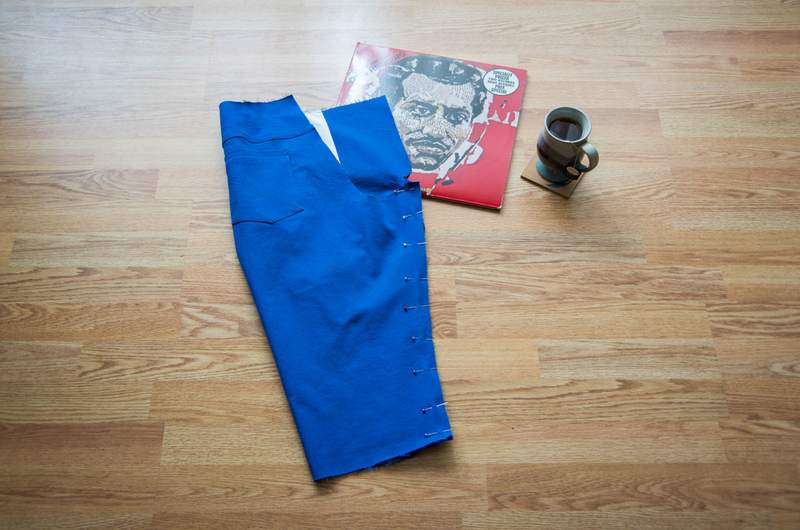 And just like that, we’ve sewn our RTW worthy flat fell inseams and our shorts are beginning to look like shorts! Now that you’re in the groove of things this week, we are ready to tackle the fly tomorrow! 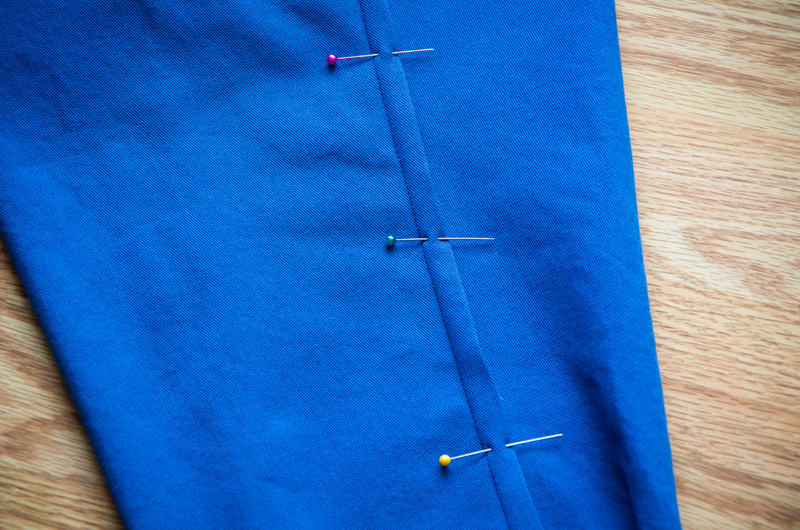 Stay tuned because we have worked SUPER hard on this next post and think it will fully demystify the previously oft-dreaded fly sewing process. I can’t wait to show you what we’ve done! Categories: jedediah shorts, Jedediah Shorts Sew-along | Tags: flat-fell, inseams, sew along | Permalink. Hi Morgan, this comment is a little late, as I am only now getting to this part of the sew-along…better late than never? ( the plus side is that it has been helpful to be able to look at everyone’s comments before even starting my project). 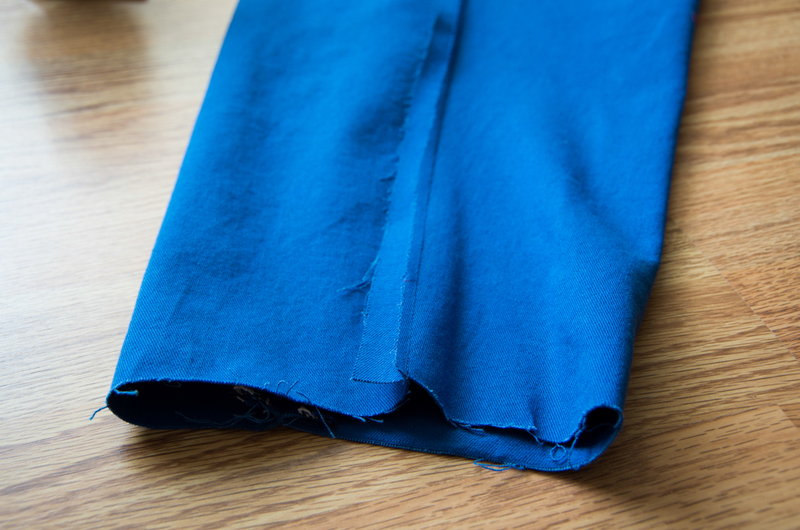 What I have found, is that it was quite difficult to do the flat-felled inseam within the 5/8″ seam allowance, as my material, a cotton twill was really wanting to fray along the edge. 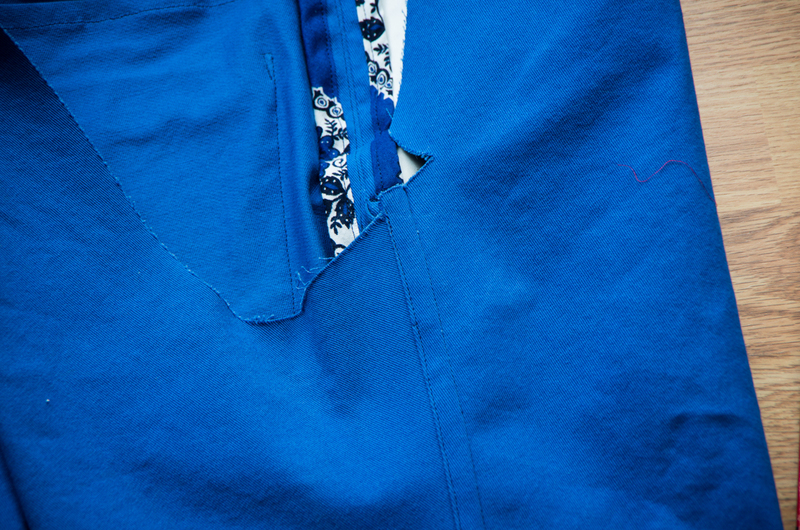 It wasn’t a problem to trim the seam to 1/4″ on the one side, but then to fold over the edge so they met, with the frayed edge, I had very little space for the top stitching. I did manage it, but it was pretty scary. I am thinking that if you have a material like this, or even a very heavy material, that it might be good to cut the seam allowances a little wider to accommodate. This is at least something that I will consider when I do the pattern again. I must say, I am really enjoying doing this project. It is the first garment sewing I’ve done since I made my high school grad dress (and we won’t mention how many years ago that was). I am really enjoying learning how to make a “well-finished” garment. I did do the the inseam before the side seam, and am very glad I did as it made it a lot easier. I am also finding that the pieces fit together very exactly which makes the sewing much easier.Thanks for the excellent pattern! That’s frustrating that your twill was fraying so much while doing your seams! I’ve encountered that on a different garment in the past and can remember the panicky feeling well…not pleasant! I guess, another solution if someone were to pick a fabric that frays easily is just to skip the flat fell seams altogether and instead sew the seam normally and serge or bind them. If they wanted the flat fell look they could press the seam allowances towards the back and then top-stitch them in place 1/4″-3/8″ away from the seam to create a faux flat fell seam. I’m glad you tried the inseam in the other direction and that it worked well for you…that certainly is an advantage of reading everyone’s tips and tricks! I’m glad that sewers have this resource to combine with the instruction booklet! Good luck with the rest of the sewing process! Are we supposed to stretch the back piece to line up with the front? The front inner edge is almost an inch longer than the back inner edge, so I’m not sure how to deal with this. 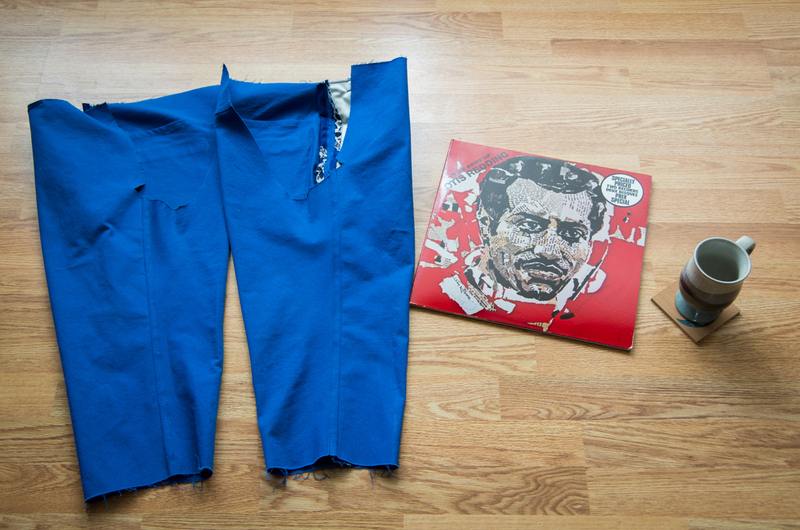 Sorry if this is a silly question – these are my first pants! Yes, the pants have been drafted with one seam shorter than the other because the fabric is meant to be stretched until the seams match so that the pant legs accommodate the curvier areas of the leg and sit nicely even while the body is moving. Because of the curves and angles along the pant legs, certain sections are cut on the bias which will allow them to stretch. There’s a diagram in the instruction booklet that indicates which area to stretch by using the steam from your iron. If your fabric is not wool based it probably won’t retain this steaming as dramatically as needed so you can simply stretch and ease as you sew instead of steaming if you would prefer (or do both!). Either way, your goal, by the time you have sewn the seam is to end up with two pieces that are the same length – you will be surprised how easy they come together…the seam ‘wants’ to ease to become the same length 🙂 I hope this helps! 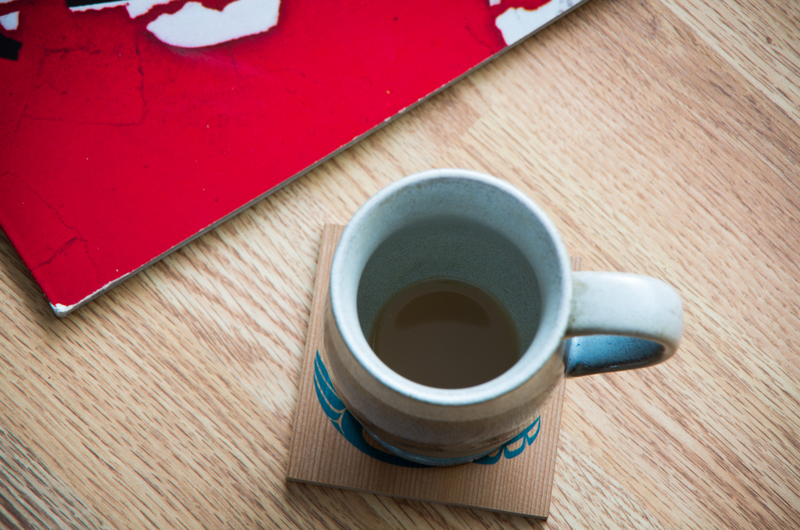 Looks like you enjoyed your Lady Grey! I just had some potato crisps with rosemary and garlic, and a glass of water. I thought I would need two glasses of water, but this was really much quicker than some of the other days. So, I have a question for you today. I was wondering about this before we even started, but figured I’d play along and see whether I understand your reasoning once we’re there—but I still don’t, so figured I’d ask. Why did we sew the out-seams before the in-seams? Wouldn’t it have been way easier the other way around? The flat-felled seams would be easier if we didn’t have a tube yet, and I think the out-seams would’ve been exactly the same work? What is it I don’t understand about this? It was a pretty quick day, wasn’t it? You’ve brought up a good point I think – I must say that I sew the inseams second only because this is the way I was instructed at school and for no good reason of my own! In the future, feel free to sew in the reverse direction if this way would be easier for you! I suppose one reason that I sew the bound seams first is that I tend to find binding a seam to be more work than other seam finishes so I like to tackle that and get it out of the way…but really, that’s no good reason to create a narrow tube to have to deal with while flat-felling, is it? Thanks for pointing this out! I will consider revising the instructions to reverse the order – certainly before we send them to print for our physical paper patterns!